We have published new guidance for clinical nurse specialists (CNS) working in local breast screening services within the NHS Breast Screening Programme (BSP). This replaces interim guidance and was developed by clinical nurse specialists currently working in breast screening. The CNS is a registered general nurse with additional relevant post-registration qualifications and experience. The CNS plays a significant role in the assessment process by evaluating a woman’s level of anxiety at an early stage and offering appropriate support. They also make sure that women get the follow-up and personalised support they need while waiting for a diagnosis. The National Cancer Patient Experience Survey (2014) found that the CNS can have a profound and positive impact on a woman’s experience and eventual outcomes. Every woman recalled for assessment following her screening mammogram should meet with a CNS at the start of her appointment. It is at this point that her anxiety levels and information needs can be assessed. In addition to the guidance document, the new publication also includes an assessment and referral form to be used by the CNS to record important patient information obtained at assessment. This can be amended to suit local circumstances if required. 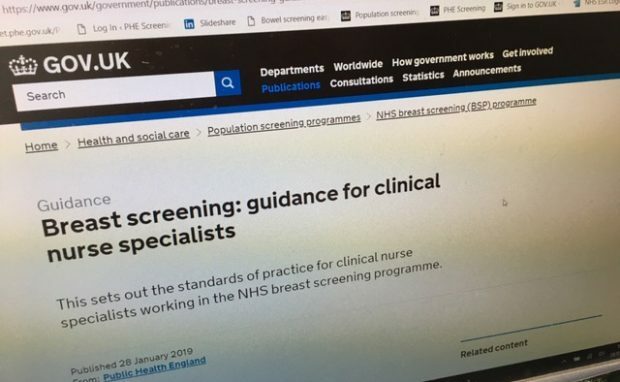 Breast screening providers and commissioners should refer to the new guidance for standards of practice for clinical nurse specialists working in the programme.